Big challenges were on the table for the Central Committee of the Communist Party of Canada, when it met Jan. 30-31 to launch preparations for the party’s upcoming 38th Central Convention in Toronto. The centrepiece of the meeting was the Draft Political Resolution for the May 21-23 convention, a document which will be debated by members at club meetings and provincial gatherings over the next three months. The meeting also discussed ongoing work to increase the party’s membership base, and leadership changes. For the first time since 1992, the Party now has a new central leader. Following the resignation of Miguel Figueroa, the CC elected Liz Rowley to the position. The long-time Ontario leader, Rowley becomes the first woman to lead the CPC. More: Read the full release here. The 22-member CC is the party’s leading body between conventions, tasked with guiding the activity of Communists across the country amid a rapidly changing political landscape. This was the CC’s first meeting since the historic defeat of the far-right Harper Tories last October. A large part of the agenda was devoted to analysing that election outcome, which the CPC calls a major victory for the working class. The first in-depth discussion at the CC meeting was around the increasingly dangerous international situation. “As the systemic crisis of capitalism continues to deepen, and the effects of the 2008 economic meltdown continue to be felt, imperialist states and organizations are becoming increasingly aggressive,” warns the opening section of the Resolution. The document goes on to provide a detailed overview of the international scene, from the complicated struggles by the working class in Latin America against the return of right-wing, austerity policies, to solidarity with the Palestinian people, opposition to fascist and racist movements in many countries, and much more. Turning to the domestic situation, the Draft Political Resolution notes that “on the fundamental economic and class issues, the Liberals refuse to consider increased corporate taxes, and they are pushing the TPP and other corporate deals. They have no plans to expand Medicare, pensions and universal social programs, to guarantee labour rights, or to consider nationalization or restoration of privatized public assets. The document also contains a detailed analysis of politics in Quebec, where the labour and student movements have conducted major struggles in recent years, and where the left-wing Quebec Solidaire party now has three seats in the National Assembly. The CC also considered new strategies to help build stronger popular mobilizations against the corporate agenda. In the months ahead, the Communist Party will be raising a clarion call to stop ratification of the TPP, which was signed in New Zealand on Feb. 4 but must still be ratified to take effect. The Communist campaign will include street tables and petitions, support for statements and resolutions at union locals and labour councils, and other creative tactics to raise awareness of this urgent issue. 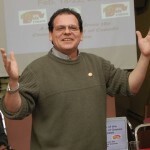 The Communist Party’s Central Organizer, Johan Boyden, presented detailed reports on the CPC’s ambitious campaign in the federal election, including the nomination of 26 candidates across the country. One positive outcome of this campaign, said Boyden, was the formation of a new CPC club in St. John’s, Newfoundland, where a Communist was on the ballot for the first time.